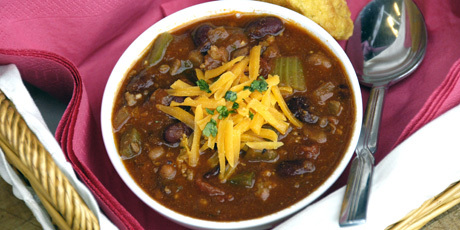 Zesty beef and Italian sausage chili with two types of beans. Per serving: 274 calories, 7.4 g total fat (3.4 g saturated fat), 24 g protein, 30 g carbohydrate, 10 g fibre, 47 mg cholesterol, 892 mg sodium. Tip: If you can, make this chili one day before you want to serve it. It thickens as it sits overnight and tastes even better the next day! Heinz Baked Beans in Tomato Sauce are a good choice for this recipe and are usually available at grocery stores. 1. Cook sausage, beef, garlic and onions in a large pot over medium-high heat until meat is no longer pink. Add celery and green pepper. Cook and stir for 3 minutes, or until vegetables begin to soften. 2. Stir in chili powder, cumin, oregano, coriander, and black pepper. Cook for 1 more minute. Add undrained tomatoes, tomato sauce, beef broth and celery leaves. Bring mixture to a boil. Reduce heat to low. Cover and simmer for 20 minutes, stirring occasionally. 3. Add beans and simmer, covered, for 10 more minutes. Remove from heat. Stir in cilantro, lime juice and honey. Serve chili topped with grated cheddar, if desired.